DOM Distribution is an Australian distributor for Teejet Technologies, providing product service and parts through our national dealer network. TeeJet Technologies principle focus is on application technologies. The company and its products have been part of agricultural applications since the 1940's when first crop protection products emerged onto the agricultural market. The Teejet Technologies Type 24216A-NYB Triple Nozzle Body for wet booms has been designed to make changing spray tips more practical, particulary in the field. 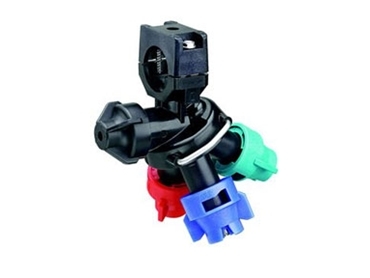 The Triple Nozzle Body provides three spray positions and features a ChemSaver check valve to ensure a drip free shut off and reduce wastage of chemical products. The Teejet Type 24216A-NYB can be mounted onto 20mm, 0.5inch, 0.75inch and 1inch pipe. DOM Distribution is proud to supply Teejet’s extensive range of quality products and technical solutions for every requirement.